The idea that the government collects data on everything you do online is no longer stuff of dystopian fiction. When we consider the Vault 7 revelations, Edward Snowden’s ongoing leak of NSA documents and privacy changes that allow Internet Service Providers to sell the data of their users, we can no longer plead ignorance when it comes to our privacy. Everything you do online is available to anyone with the will and means to access it. Whether it’s cyber criminals or your own government. Yet there are ways to protect your activity online without disconnecting entirely. A Virtual Private Network, or VPN for short, creates private tunnels for your online activity to pass through. Cost-effective and easy to setup, taking control of your privacy can be as simple as a software download. Stick around as we will explore why a VPN can be an important tool to protect your privacy and show the easiest way to set it up. To explain this it may be simpler to first explain how a computer transmits data between itself and a website. Usually, traffic between a computer and a website involves the transfer of packets. A little like mail in real life, these packets transfer information from the sender (your computer) to the recipient (the website you are trying to reach) and vice versa. The problem with these unsecured packets is that they can be intercepted (be it via WiFi, mobile radio signals or your router), exposing your traffic which contains information on which websites you were visiting and what you were doing there. This is known as a man-in-the middle attack and is a big reason why public wifi is so risky. When you sit down for a coffee and connect to public WiFi, you are vulnerable to having your traffic sniffed. This is where a VPN comes in handy. Connecting to a VPN is like having a loud, private conversation with a friend in that same cafe, but in a language only known to the two of you. The role of a VPN, therefore, is to mask traffic in such a way that even if it is intercepted, it cannot be read. “Privacy is necessary for an open society in the electronic age. Privacy is not secrecy. An observed life is not a truly free life. To what extent should a government, or other entities for that matter, monitor your actions, browsing habits, or online accounts? Taking control of your privacy is necessary but it is only one reason for using a VPN. We’ve already briefly touched on public WiFi and the dangers it poses to your security. A VPN masks your traffic and activities adding an extra layer of protection when in airports, cafes, libraries or anywhere else you choose to connect your device to an open access point. Though nothing is 100% impenetrable, while connected to public hotspots your traffic will be much safer with a VPN than without one. Some streaming services restrict their content to specific regions, such as Hulu, HBO on demand and many others. A VPN grants your location a certain degree of anonymity, allowing you to access content when outside of your country. This can be particularly useful if you are travelling away from home and want to keep up with your local TV shows and news programs. However, some television networks have begun blocking access to users if they detect that you are using a VPN. With the ongoing US privacy controversy centred around the ISPs ability to sell-on your data or share it with government surveillance programs, a VPN is a solid choice to keep sniffers out. This is not to say you have anything to hide. But with a VPN, you alone can choose what is available for companies and government programs to access. Let’s also not forget that the above points have significant humanitarian applications. By masking the geolocation of a user, citizens can access news and other sites from outside of their silenced countries. Where information is controlled and altered by a government, residents in restrictive regimes have the ability to share what is happening in their country to an extent. This is particularly important for journalists and their sources. VPNs offer many benefits to protecting your privacy or simply letting you watch your favourite shows directly out of the US before they become available in your country. However, like any technology, if someone is willing to put in the time and effort to get in, they can. We’ve explained how a man-in-the-middle attack can occur on an unencrypted network and how a VPN service prevents this from happening. What you may have worked out by now is that the use of a VPN simply allows you to elect a trusted man-in-the-middle to look after your data. Your VPN provider encrypts your traffic for you, meaning they have access to the original traffic, where it came from and all that it contains. For this reason, choosing a VPN provider is a matter of trust. Please don’t use a free VPN service. Really. If your VPN service is not making money from your subscription fees then it is making it elsewhere, like selling your personal information to a third-party who can spam you senseless. For VPN companies to maintain their servers is very expensive and the old adage holds true: if you’re not paying for it, you’re the product. We mean it. Don’t use a free VPN service. It is growing more and more difficult to be 100% anonymous online. So when you sign up for your VPN, you want to be giving as few identifiable details as possible. If you can’t pay in Bitcoin or with gift cards, you are not signing up for an anonymous service. Emsisoft Tip: If your chosen VPN provider asks you for more than an email address on sign-up, you are not anonymous. It is not common to seek perfect anonymity when purchasing a service but it is available with the right VPN provider if you are looking for it. Understand which encryption protocols your provider offers. 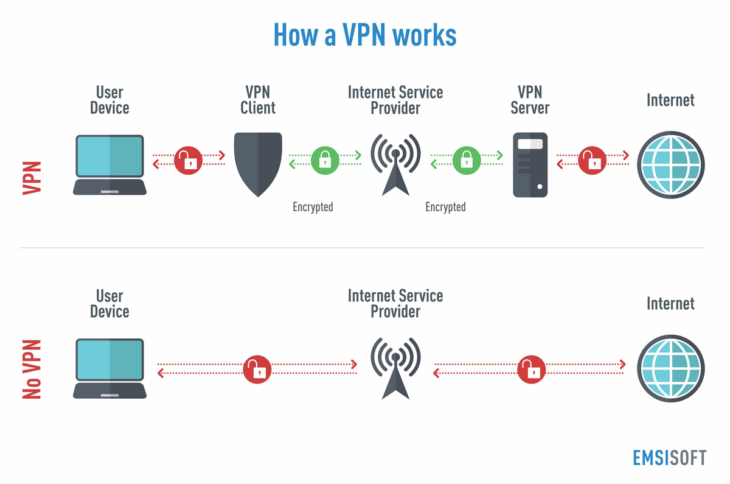 Open VPN is highly configurable and regarded as the most secure VPN protocol. Ideally, your VPN of choice will utilise this encryption method. IKEv2 is also very good but try to avoid using the PPTP protocol, which has known security risks. It is important for you to understand what logs your VPN provider will be keeping. Ideally, your VPN provider will not keep any logs of any kind and be transparent about what data they keep. Additionally, look for a service with a multi-chain hop. If your traffic is being monitored externally, the hops help to further anonymise your traffic. Each hop represents a different VPN server, usually in a different jurisdiction, so your location and IP are changed multiple times before reaching its final destination. Make sure your provider’s no-log policy includes not tracking of IP addresses and timestamps. Ensure your VPN has clear policies and easy opt-out options for affiliates. The last thing you want is to set up your VPN service to find it bundled with spam pop-ups or hidden third party access to your data. If your provider has no affiliates, all the better for you. As we mentioned earlier, the benefits of using a paid service far outweigh those of a free service. You can’t always be sure that a service will keep your data secure, but if your provider is receiving money for their service they are less likely to be selling your email address or other personal information to third parties. Additionally, paid providers typically have faster connections. As with any technology, there will be a small learning curve to get your head around the more technical aspects. Additionally, as your traffic is being encrypted as it passes through the tunnel, your download speeds can suffer slightly. Complete anonymity is virtually impossible but a VPN gives you extra protection necessary for basic privacy. Finally, some websites may refuse to work if they detect a VPN. Netflix has clamped down on site visitors masking their geolocations to stream US Netflix outside of the States. Now that we’ve shared ours, what are your top tips for protecting your privacy online?